The summer of 1976 we ran like hamsters on the Seaview-to-October-Miniatures-Show wheel (mini-historians: was the NAME California regional show that year in San Diego? Santa Rosa?). A 6-pack of Coors cost $1.36, a price Noel groused about so much my mother sent him a shirt cardboard with 136 pennies taped to it. We never let on exactly how much we needed even that amount. If we wanted wine, we sipped the barely palatable peach or blackberry concoctions Noel and a neighbor brewed next door. Our aim was always to make our houses look and feel old and lived in–houses with age lines that told stories reflecting their years, rather than old-time houses just built. For the Seaview’s porch decks we cut planks from naturally weathered scavenged (from a field on the back road) de-laminated plywood. 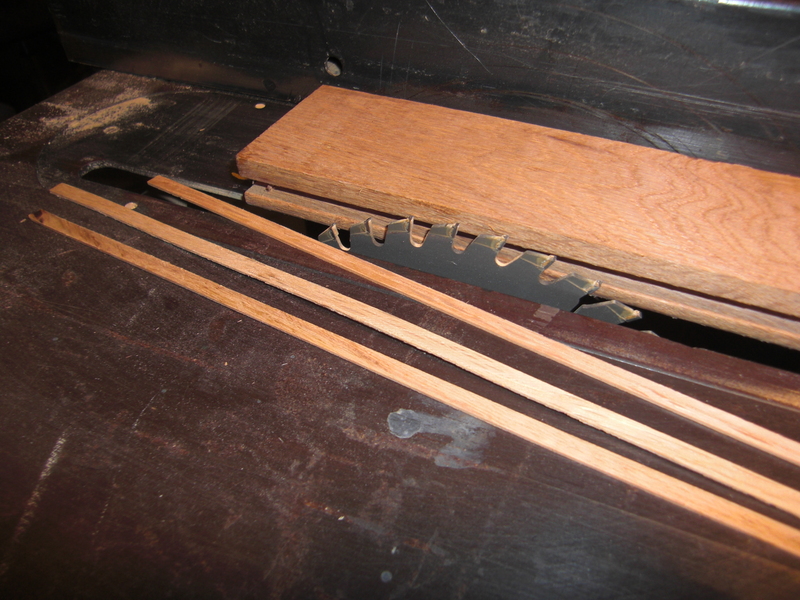 Noel milled mini-floorboards from the short ends of full-size oak flooring on the 10″ table saw we brought from Calif. It took only one trip through the ER, and a permanently creased thumb, to convince him to respect its powers. The oak came from the back of the lumber yard–boxes of it no one else wanted, all for $10.00–enough to make our full-size kitchen counters, and to floor all our mini-houses up to the present. There’s still a stack in the basement to pass along. 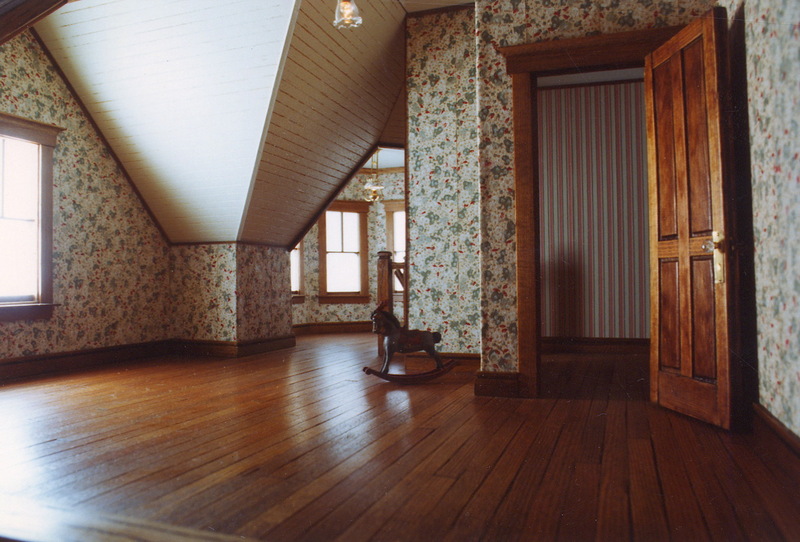 The more formal ground floor rooms were oak, inlaid with cherry banding, and the third floor was straight-grained fir like the floors in our full-size beach house. For the Seaview’s walls, I cut wallpaper in strips from a few discovered rolls of old, water-based clay-printed full-size papers, along with patterns cut down from discarded wallpaper sample books. We hadn’t yet discovered the real cache of 1930’s clay-printed papers we would find in the back of an art supply store in Astoria. The background had yellowed, and the designs were printed in clay, which gave them a slightly dimensional feel. It even smelled old. All on their own, the papers evoked another time. Years earlier Noel’s daughter Robin had observed that walls covered in a single sheet of paper were unconvincing—they had to be cut into in-scale strips, and butted together. It was one of those details that, added in with the rest, made up what we would later call the illusion of reality—part of what evokes the viewers’ memories, and gets them involved. 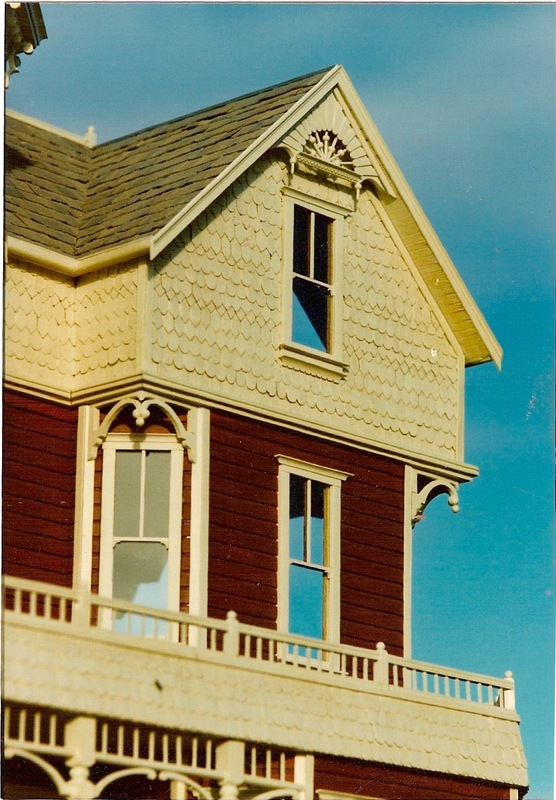 We also found that coffee stir-sticks for decorative shingles wouldn’t fly—they were out of scale and looked dopey. Instead, we learned to slice scallops and diamonds from cedar stock, thousands of them on a Dremel jig saw, thin enough so the built-up thickness would work in 1/12 scale. 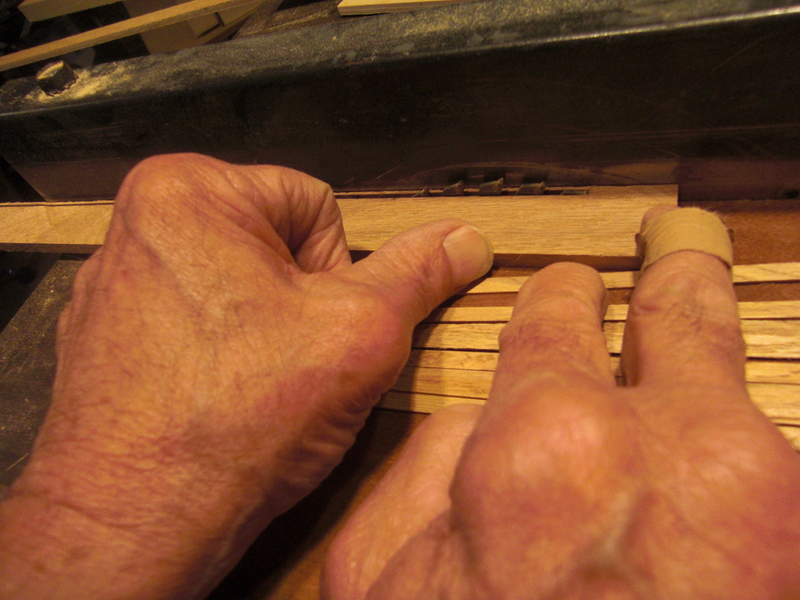 Each roof shingle was hand-cut from veneer. I would go into my Shingle Zen and just cut and glue until it was done. It became a fairly relaxing escape. People ask how many shingles, or how many floorboards, or bricks went into a house, and we don’t know. The point wasn’t how much, but to do it, and make it look convincing. 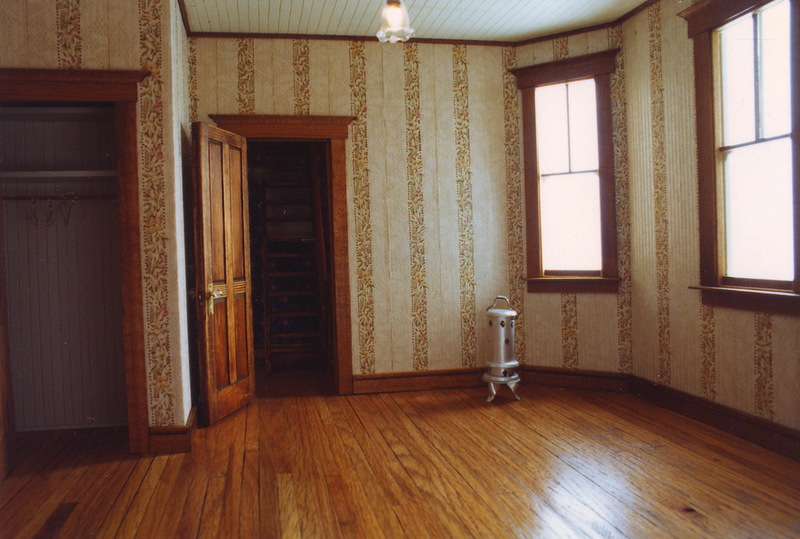 And yes, to the gluers out there, it was all done with Elmer’s white glue–floors, moldings, shingles, bricks and wallpaper–to this day everything remains in place. The miniaturists reading this will recognize the Glue Wars to which I refer. "Hey kids, don't try this at home!" This entry was posted in Miniatures and tagged architecture, beer & wine, Elmer's, flooring, shingles, the Glue Wars, wallpaper. Bookmark the permalink. I had never even considered that a sheet of wall paper wasnt realistic but that is so true! 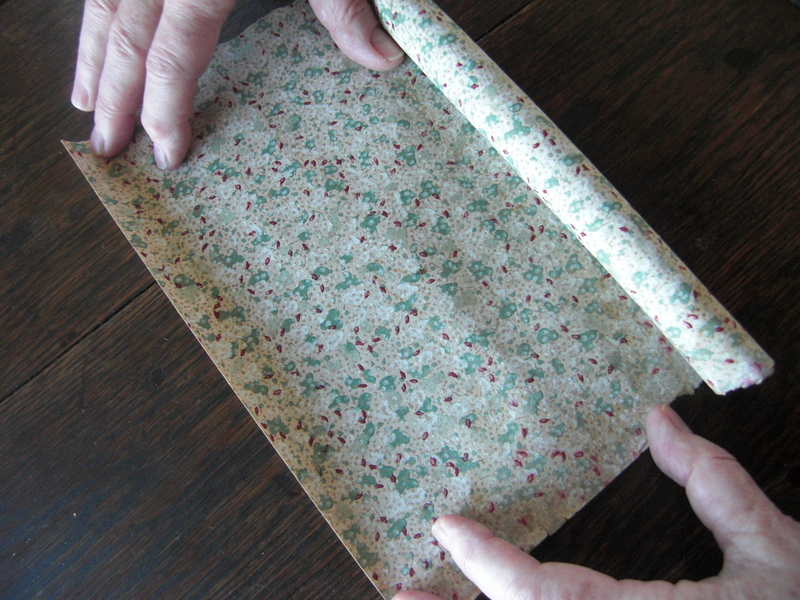 can you imagine people toting 15 foot long rolls of wallpaper into their homes?